In my previous posting on this topic I focused on determining cache buffer chain (CBC) wait time acquisition patterns; disperse or singular. A disperse pattern occurs when many CBC latches are active. In contrast, there are situations when only one or a few CBC child latches are extremely active, hence the singular pattern. In my previous posting, I also listed some disperse pattern solutions. Figure 1. A 300 second CBC child latch acquisition activity collection SQL and report. Notice the last three child latches are the most active and have the most sleeps (which we see as "waits"). This is an unusual post because it's rare my work is published by traditional media. The magazine DB Trends and Applications (DBTA) published an article I wrote entitled, Uniting Operations Research With Time-Based DB Performance Analysis. If you receive the printed magazine it's on page 28 of the December 2011 issue but you can also read it on-line here. 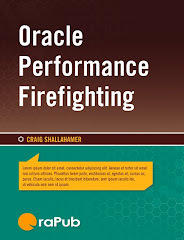 Unit of Work Time Based Analysis as the intersection of Oracle performance firefighting and Oracle forecasting and predictive analysis. This intersection is one of the main themes in my two day class, Advanced Oracle Performance Analysis. Understanding and applying the content unlocks deep performance insights and allows you to active a much high level of performance analysis. Why? Because you can objectively compare various performance solutions both numerically and visually. And this comparison can be done from a very high and abstract level (think: pictures) down to a very detailed operations research mathematical level (think: formulas). It's powerful. It's no coincidence my three classes are similarly entitled: Oracle Performance Firefighting, Advanced Oracle Performance Analysis, and finally Oracle Forecasting & Predictive Analysis. Because I rarely teach my forecasting class, I want to mention that I will be offering my Oracle Forecasting & Predictive Analysis class in Frankfurt, Germany, February 6 - 8, 2012. I just finished teaching this class in Santa Clara, CA last week and we all had a great time for sure! My firefighting courses will also be taught in Sweden the week of January 30 and also the week of February 27 in Santa Clara, California. I hope you enjoy the article! And if you have any questions, feel free to email me at orapub.general@orapub.com. All the best in your performance endeavors!